Got one rabbit - not a huge one - this afternoon and then made towards the gate for home. Got there and thought: 'well, a friend of mine might be coming over for dinner tonight - and one small rabbit's just not going to be enough...'. Walked back into the field again; five minutes later, got another one. Pleased, I sat at home and read a little of the gigantic, twelve-hundred-page Italian cookery book - The Silver Spoon - that I got for two squid from a charity shop this afternoon (with a cheap watch too - thanks to which I know that it's now exactly 7:19pm!). Looking out the window, I saw that the weather'd got a deal more lively since I got back home: strong winds, rain - and rainbows. Reading in 'The Silver Spoon ' about 'Braised Rabbit with Rosemary'; I've never tried braising before - so let's give it a go. Stuff the cavities with sprigs of rosemary, a clove of garlic, a little butter, some olive oil, splash some more oil in the pan, season with salt and pepper and - so that the meat more or less steams in its own herb-and-oil-infused juices - cook it on a low heat in a sealed pan for an hour and a half or until it's falling-off-the-bone ready. Just finished off the last of yesterday's red. Vowed I wouldn't get another bottle tonight. One more vow on the way to being broken? We'll see. Yep, thoroughly broken; picked up a cheeky Tempranillo along with some spuds at the Co-op. Thought about some green veg - but no, bugger it. Made some good gravy with fried red onions, the braising liquid and the finely chopped liver and kidney from the two rabbits. 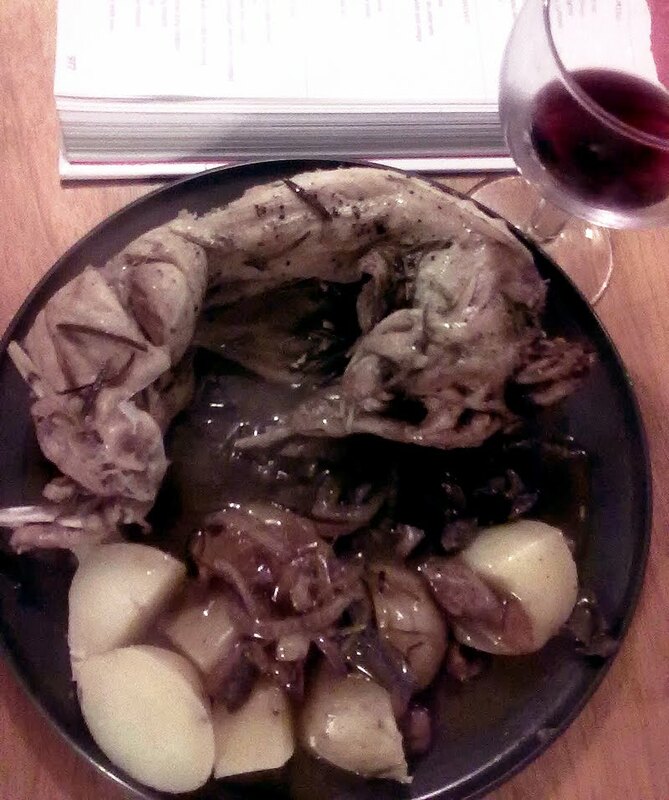 I may now have to change the name of this blog to 'The Braised Rabbit'. It really was that good - tremendously moist, fragrant and tasty. 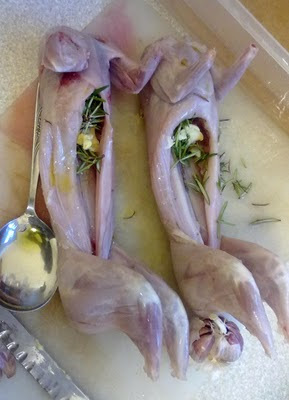 I was remembering a while back saying - all earnest - 'don't cook rabbit in olive oil!' Well, I take it back, it's fine. In fact, done this way at least, it's superb. Just wow! I bagged a couple of nice snowshoe hares this weekend so I'll have to give it a try, hope my snowshoes taste as good as the Belgians you're shooting over there. Hiya Hodgeman, Lucky you! Hares are a rarity over here in England. The recipes in the 'Silver Spoon' tend to favour marinading it for 12 hours in white or red wine with either juniper berries, marjoram & sage before cooking gently (in the marinade, usually, or a reduced version of it) for a couple of hours. One red wine version adds the blood, diced liver and cream to the stewed meat a few minutes before serving. One recipe, 'Lepre Dolche Forte' ('strong and sweet hare') cooks it with sultanas, bay leaves, pine nuts, red wine, pancetta and - wait for it - plain chocolate! Rich and sweet; sounds wonderful. Good luck with them, whatever you do.